What Makes Beveled Glass Doors Unique? Every house has a front entry door of some sort, and most of them look similar to many of the houses in the neighborhood. Talented artists who work with glass can create a unique beveled leaded glass design for your door that can make all the difference in the world. How Are Glass Doors Unique? The many designs available for beveled glass doors reflect your artistic inspiration, as well as that of your designers. It is evident in every design. Each door has artisanship that is quite inherent in every aspect of the piece. Beveled glass doors are different from any other door design. They may have sidelights and transoms, or they may have a simple, elegant style. Even the loveliest doors can be approved for the harsh weather elements we live with here in metro New Orleans, as long as they are professionally installed. Beveled glass exterior doors are crafted from premium components and are available in a variety of sizes. They are glamorous entry doors, and some of them include beveled glass inserts that are handcrafted. 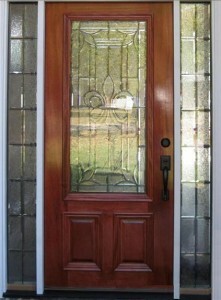 Beveled glass patterns will enhance the beauty of your exterior door and give your home elegant curb appeal. Fine quality doors also give off a feeling of hospitality and warmth. If you’re shopping for beveled glass doors, you probably have seen quite a few high price tags. They don’t have to be over the top price-wise, but these doors will add value to your home as soon as they are installed. You will also save money on maintenance, using a unique door for your home. These doors, when they are maintained properly, will not need replacement nearly as soon as fiberglass doors do. According to Wise Geek, they may last even four times the duration of fiberglass doors. Beveled glass has edges that give it the name. Beveled refers to cuts made at angles less than 90 degrees. Beveled edges are often used to add a unique, decorative style to your entryway. If you want to capture light in a unique way, beveled glass will do this, as compared to other types of glass. This creates many colors, and enhances the visual beauty of the glass. The makers of windows and doors may use beveled glass to add to a design that can be simple or ornate. Using beveled glass with other design elements will increase the value of your home and its visual appeal, as well. Beveled glass is sometimes found in door sidelights and transom windows. It may be more commonly seen on homes with ornate exterior doors. On these homes, as on yours, it will create a look of style and sophistication. Traditional beveled glass is conventional cut glass, but the technique can also be used on textured, colored glass to create a unique design. Textured glass that has beveled edges will increase your options when creating new exterior doors. Look at the frame when you purchase beveled glass, too. The glass should have the exact same depth visible on all sides. Make sure to have a professional install your beveled glass door, so that it will create beauty in your entryway for years to come.